Aberdeen full-back Shay Logan found himself well and truly stitched up on his stag do, after he was forced to head off at the airport dressed as Celtic captain Scott Brown. It has become a sacred tradition that the stag must be embarrassed in public in the final getaway before their marriage and the friends of the 31-year-old were a little more imaginative than the usual stag party in their tormenting of the Aberdeen footballer. Logan was forced to wear a full Celtic strip to and on their flight to Tenerife over the weekend as he took full advantage of the international break, doing so whilst having ‘Brown 8’ on the back to add insult to injury. He wasn’t too impressed with the choice of outfit, defiantly posting a picture of himself along with his friends in the kit saying: Stag do or not I’m still a f*****g DON. Logan has a checkered relationship with Celtic from his lengthy time north of the border in the Scottish Premiership, being involved in a number of incidents involving the club, starting in 2014. He accused on-loan Aston Villa midfielder Aleksander Tonev of racially abusing him during a Scottish Premiership match, from which the Bulgarian was found guilty at a hearing and subsequently handed a seven match ban. In response, Logan tweeted: "Do the crime, serve the time. Off ya pop geezer. #KickRacismOutOfFootball." It wasn’t the first, nor certainly the last time in which Logan has taken to the social media platform to express his emotions, doing so on one evening back in October 2017 when Celtic were thrashed by Bayern Munich in the Champions League. 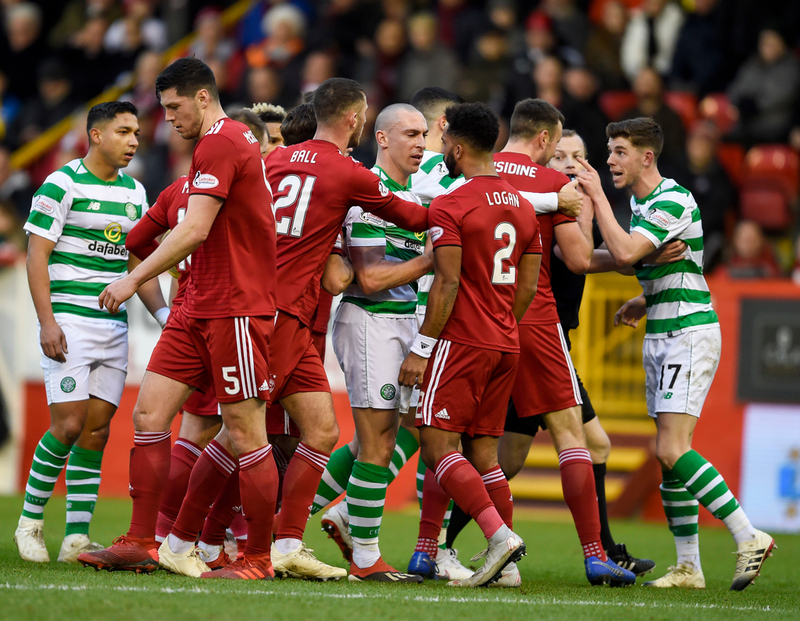 Brown and Logan have been facing each other for years, with a contest between the two sides last year resulting in Sam Cosgrove being sent off after a rash challenge on the Celtic captain. In the aftermath of it, Logan struck the ball at Brown, who had twice been hacked down by Aberdeen players, before then lifting his shorts and provoking the Aberdeen supporters. After the game, Brown told Celtic TV: "Wee Logan did a runner right after it as he usually does." At the end of last season, Logan was part of the Aberdeen squad that beat Celtic away from home to secure another second-placed finish in the Scottish Premiership and revelled in the three points. Such were the extent of the 31-year-old’s celebrations, that he was shown a red card after the full-time whistle for taunting Celtic fans and pointing to his ears, sparking frustrated scenes from members of the Celtic squad also. He was then fined by manager McInnes. Despite having to don the Celtic strip for the first time in his life, it's fair to say that Logan won’t be in too much of a rush to get back into the green and white hoops at any point in the near future.